If you’re looking to add a variable-speed drive to an application such as food and beverage production, water and wastewater processing or textile manufacturing, you might initially consider buying one outright. However, there are plenty of occasions when it makes sense to lease a VSD on a short-term basis. We look at five of them here. 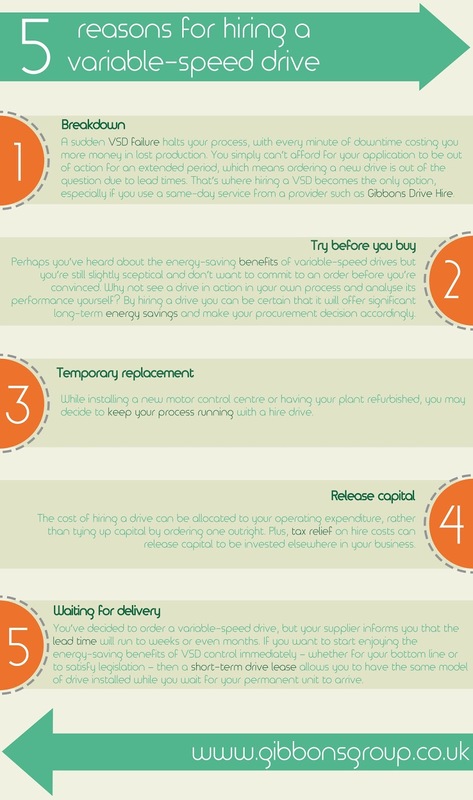 Whatever your reason for hiring a VSD, it’s important to select a trusted, reliable provider such as Gibbons Drive Hire. We are specially-approved by leading drives manufacturer ABB as one of their Authorized Value Providers, meaning we have the expertise to help you select the ideal product for your application. A fleet of vehicles and a team of experienced engineers are available to deliver your hire drive before carrying out installation and commissioning. If you’re leasing a drive due to a VSD breakdown, we’ll repair the failed unit and re-install it at a time that suits you so as to cause minimal disruption to your business. For more information on Gibbons Drive Hire, call Carl Green on 01621 868138 or email carlg@gibbonsgroup.co.uk.